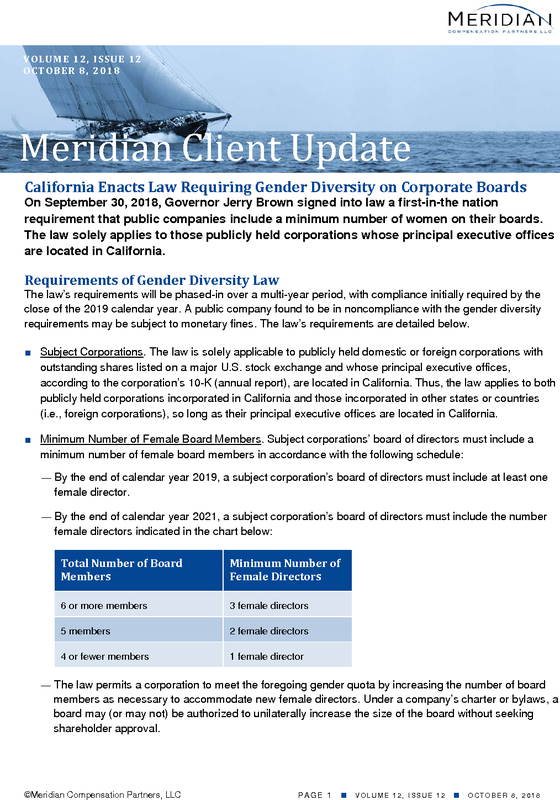 On September 30, 2018, Governor Jerry Brown signed into law a first-in-the nation requirement that public companies include a minimum number of women on their boards. The law solely applies to those publicly held corporations whose principal executive offices are located in California. The law’s requirements will be phased-in over a multi-year period, with compliance initially required by the close of the 2019 calendar year. A public company found to be in noncompliance with the gender diversity requirements may be subject to monetary fines. The law’s requirements are detailed below. ■ Subject Corporations. The law is solely applicable to publicly held domestic or foreign corporations with outstanding shares listed on a major U.S. stock exchange and whose principal executive offices, according to the corporation’s 10-K (annual report), are located in California. Thus, the law applies to both publicly held corporations incorporated in California and those incorporated in other states or countries (i.e., foreign corporations), so long as their principal executive offices are located in California. ― By the end of calendar year 2019, a subject corporation’s board of directors must include at least one female director. ― The law permits a corporation to meet the foregoing gender quota by increasing the number of board members as necessary to accommodate new female directors. Under a company’s charter or bylaws, a board may (or may not) be authorized to unilaterally increase the size of the board without seeking shareholder approval. ― For a first violation, the amount of $100,000. ― For a second or subsequent violation, the amount of $300,000. A subject corporation will be in noncompliance with the new law if a woman does not hold the required seat for at least a portion of a calendar year. In addition, the law authorizes, but does not require, the California Secretary of State to impose a $100,000 fine on subject corporations that fail to timely report board composition (e.g., gender information). ― No later than July 1, 2019, the Secretary of State must publish a report on the number of domestic and foreign corporations whose principal executive offices, according to the corporation’s 10-K (annual report), are located in California and who have at least one female director. The number of subject corporations that were in compliance with the requirements of the law during at least one point during the preceding calendar year. The number of publicly held corporations that moved their United States headquarters to California from another state or out of California into another state during the preceding calendar year. The number of subject corporations during the preceding year that are no longer publicly traded. The preamble to the law cites two principal reasons for the law’s adoption: (i) to address the slow pace of gender diversification on publicly held corporation boards and (ii) to enhance corporate performance. According to an outside study cited in the preamble, “it will take 40 or 50 years to achieve gender parity, if something is not done proactively.” Moreover, the preamble references four independent studies that have concluded that corporate performance is enhanced when women serve on the board. As further support for the new law, the preamble notes that other countries, such as Germany, Norway, France, Spain, Iceland and the Netherlands, have addressed the lack of gender diversity on corporate boards through mandated gender quotas. Currently, the major proxy advisory firms’ voting policies do not include prescriptive requirements regarding female representation on corporate boards. However, Institutional Shareholder Services (ISS) has been considering this matter over the past several years, as evidenced by its annual policy surveys. We would not be surprised if ISS, within the next couple of years, updated its proxy voting policies to cover board gender diversity. Meanwhile, Glass Lewis is phasing in a voting policy on board gender diversity. Starting in 2019, Glass Lewis will generally recommend voting against the nominating committee chair of a Russell 3000 company’s board that has no female members, unless the company provides a sufficient rationale for lacking any female board members or discloses a plan to address the lack of board gender diversity. 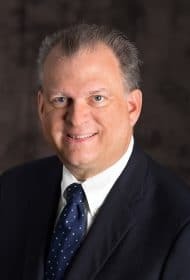 Moreover, Glass Lewis may recommend a vote against other nominating committee members depending on the size of the company, the industry in which the company operates and the governance profile of the company. Beyond individual state mandates and the voting policies of the proxy advisers, institutional shareholders loom as potentially the most influential parties on the issue of gender diversity on corporate boards. BlackRock, Vanguard, State Street and pension funds such as CalPERS and CalSTERS have called for greater board gender diversity. Currently, most institutional shareholders’ proxy voting policies do not directly address diversity. We anticipate that will change over time, especially with respect to the gender composition of corporate boards as well as senior management. 1 Governor Brown’s Signing Statement dated September 30, 2018. Available at https://www.gov.ca.gov/wp-content/uploads/2018/09/SB-826-signing-message.pdf. 2 State Street Global Advisors press release dated November 14, 2017. Available at https://newsroom.statestreet.com/press-release/corporate/state-street-global-advisors-expands-board-diversity-guidance-companies-japa. 3 Bloomberg Law News. “State Street to Vote Against More Directors at Male-Only Boards.” September 27, 2018. Available at https://www.bloomberg.com/news/articles/2018-09-27/state-street-to-vote-against-more-directors-at-male-only-boards. 4 Letter from Larry Fink, Chair and CEO of BlackRock. Available at https://www.blackrock.com/corporate/investor-relations/larry-fink-ceo-letter. 5 BlackRock’s “Proxy Voting Guidelines for U.S. Securities”, published February 2018. Available at https://www.blackrock.com/corporate/literature/fact-sheet/blk-responsible-investment-guidelines-us.pdf. 6 Vanguard’s “open letter to directors of public companies worldwide” dated August 31, 2017. Available at https://about.vanguard.com/investment-stewardship/governance-letter-to-companies.pdf.